BMW 318ti: its Launch, Failure, and Legacy in the U.S.
BMW released the E36 hatchback in Europe for the 1994 model year. Dubbed the BMW 3 Series Compact, it was arguably BMW's boldest attempt at moving down-market and attracting younger buyers to the brand. But at a base price of just $19,900 with typical luxury features like leather and power sunroof only available as options, the Compact didn't fall into the luxury class. 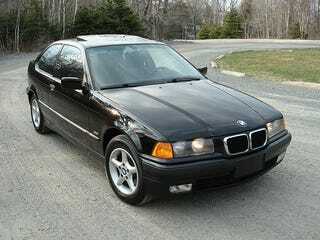 Nevertheless, European sales were promising enough for BMW to release the Compact in the U.S. for the 1995 model year. While the Compact was available with any of five engines in Europe, only one model came to the U.S.: the 318ti. BMW's initial U.S. sales target for the 318ti was 6,000-10,000 a year, accounting for 15-20 percent of 3 Series sales in the U.S. market. Below is a tally of 318ti sales in the U.S. for each model year (total 3 Series sales and overall BMW sales in the U.S. are included for comparison). The BMW 318ti only met its U.S. sales target in 1996, and the number of 318ti hatchbacks sold dropped by nearly 1,000 from 1997 to 1998, its last year in the U.S. market. In 1996, 318ti sales accounted for 15 percent of total 3 Series sales in the U.S., barely meeting BMW's target of 15-20 percent. In all other years sold, the 318ti never reached 10 percent of U.S. 3 Series sales. BMW never attempted to convince buyers that its $19,900 hatchback was a luxury car. By BMW's own account, all of the Compact's competitors were non-luxury vehicles: Acura Integra, Honda Prelude, Toyota Celica, Mazda MX-6, Nissan 240SX, and Saab 900. Of these vehicles, however, only the Saab, Acura, and Toyota were hatchbacks. With the 318ti, BMW went after the same two target audiences its competitors sought: men and women between the ages of 25 and 35, and "empty-nesters" between 40 and 50. BMW expected those in the first category, drivers under 35, to account for half of the 318ti's U.S. sales. Those in the second category, the older empty-nesters, were to account for about a third of the 318ti's U.S. sales. The younger buyers were expected to have a median income of $55,000. The empty-nesters were to have a median income of $75,000. Compare that to $78,000 for buyers of the 318i sedan, $107,000 for buyers of the 325i sedan, and $130,000 for buyers of the M3 coupé and convertible. In a bid to attract buyers, BMW released two packages for the 318ti, each costing $2,400. The Active package added leather upholstery, cruise control, remote keyless entry, a power sunroof, and custom wheels. The Sport package added a stiffer suspension, fog lights, bucket seats, and patterned upholstery. A folding canvas panoramic sunroof was introduced in 1996; models with this option were sold as the 318ti "California Edition." As more options were offered, however, the car became less and less affordable. Once packages, additional options, and fees were taken into account, the 318ti could easily cost upwards of $25,000, well above the costs of competitors. In 1996, the little 318ti launched BMW into an entirely new world of marketing: the internet. That summer, BMW released a web banner ad for the 318ti, the first of its kind for the automaker. The ad debuted on sites frequented by younger web surfers, including ESPNet SportsZone and web magazine Crisp. BMW also developed its first internet promotion, offering printable coupons for 318ti test drives on the BMW homepage. BMW's internet campaign sparked American consumers' interest in the 318ti, and U.S. sales rose from 4,433 in 1995 to 7,100 in 1996. Interest quickly waned, however, and by 1997, U.S. sales had dropped by nearly 2,500. By 1998, the 318ti was accounting for just six percent of 3 Series sales in the U.S., and BMW pulled the car from the U.S. market. The BMW 3 Series Compact demonstrated that image cannot be defined by brand prestige alone. Image-conscious consumers were largely unimpressed with the 318ti's hatchback styling. And despite the car's relative affordability compared to other BMW models, it didn't attract many non-luxury U.S. consumers, either. Most found similar offerings from Saab, Toyota, and Honda to be more affordable. Potential American buyers were also disappointed by the car's lack of power; the 318ti was powered by a modest 138hp inline 4-cylinder engine, and was capable of an equally modest top speed of 116 mph. Competing luxury brands took note of the 318ti's U.S. flop, and similar projects were either put off or abandoned entirely. In 2002, Mercedes-Benz (somewhat bravely) attempted to follow BMW's example with its own C-Class Sportcoupé. And while it showed initial promise, it too failed to meet sales targets in a market that has always turned its nose up at the practical hatchback.